The seventh report of the Taxonomic Sub-committee of the BOU Records Committee has just published. The changes suggested within the report have now been incorporated into BUBO Listing for use within all lists based on the BOU authority, as well as our combined "Britain & Ireland" authority (i.e. the combination of the decisions of the BOURC and the IRBC). Of most relevance to birders, the report adds three additional species to the British List: Hudsonian Whimbrel Numenius hudsonicus (split from Eurasian Whimbrel N. phaeopus), Cabot's Tern Sterna acuflavida (split from Sandwich Tern S. sandvicensis) and Siberian Stonechat Saxicola maura (split from European Stonechat S. rubicola). Some BUBO listers are likely to be in line for some armchair ticks therefore, with Siberian Stonechat being a scarce but regular autumn vagrant and a number of recent records of Hudsonian Whimbrel. The only accepted record of Cabot's Tern to date, however, is of a bird in Herefordshire in 1984 which had been ringed in North Carolina. These additions bring the total number of species recognised by the BOU to 595 (with a further eight pending species also available within BUBO listing). An Eastern Crowned Warbler, a long-anticipated first for Britain & Ireland, was found at Trow Quarry, South Shields, Co Durham, on 22nd October 2009. 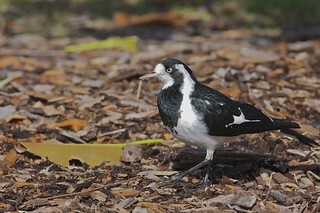 The finder posted a photograph of the bird on Birdforums and news quickly spread. The bird was still present at dawn on 23rd October and enjoyed by crowds of British birders. Eastern Crowned Warbler has now been added as a "pending" addition to BOU, Britain & Ireland, Birdwatch and UK400 baselists, and so can be added by those birders who have made the trip to see this super little bird. The autumn rarity season notched up a gear or two in the UK on 16th September with the astonishing news that a Tufted Puffin had been found in Kent. Watched off Oare Marshes by just seven lucky observers for 20 minutes, the bird was seen in flight and on the sea, and diagnostic photographs were taken. Unfortunately for everyone else, it then flew off west along the Swale Estuary and despite much searching was never seen again (at least not at the time of writing!) It later transpired that what was probably the same bird was seen earlier flying west past Herne Bay. The finder, Murray Wright, has described the amazing events of the day on the Kent Ornithological Society website. Tufted Puffin is already on the Western Palearctic list on the strength of a bird in Sweden in June 1994, whilst another was reported off Greenland in summer 2009. Its true range, however, is along both Asian and American coastlines of the north Pacific, breeding as far south as California. Vagrants from the north Pacific are not entirely unprecedented in the UK, with Long-billed and Ancient Murrelets, Pacific Diver, Glaucous-winged Gull and Aleutian Tern all recorded over the years. However, the frequency of such events does seem to be on the increase, with a very plausible hypothesis linking this with the retreat of summer ice from the northern shores of Alaska and Canada, whilst this summer the "north-east passage" along the northern shores of Siberia was entirely ice-free. Investigations in captive birds have so far revealed birds only in "Living Coasts" in Devon, and enquiries have apparently resulted in confirmation that they haven't lost any. It looks overwhelmingly likely, for the time being, that this is indeed a wild bird. BUBO Listing has now added Tufted Puffin as a "pending" addition to authorities available for British listing purposes (BOU, Britain & Ireland, Birdwatch magazine, UK400 club), in case any of the lucky seven want to add it to their lists (or, preferably, in case it reappears over the next few days for the rest of us!) If, at a later date, any of these authorities rejects this record then it will be removed from BUBO at that stage. Three of these were already included in BUBO Listing for British and Irish lists as provisional species, the other (Yellow-nosed Albatross) had not been added since no birder had seen it! We have now added this, and removed the provisional status of the other three species. The British List now officially stands at 587 species, and BUBO Listing currently includes another five provisional species. It is already clear that the autumn of 2008 will be remembered for many years to come in the British & Irish birding community. However, not content with Little Blue Heron, Alder Flycatcher, Philadelphia Vireo, Cretzschmar's Bunting and Brown Shrike, another mega has just been revealed. Unfortunately, it appears to have departed before anyone was aware of its true identity. When a second calendar-year male Red-footed Falcon appeared on 14th September at Tophill Low in East Yorkshire, it attracted relatively little attention. This species has become increasingly regular in Britain in recent years, and is no longer considered by the British Birds Rarities Committee. However, during its long stay, it was admired by a steady trickle of observers. During most of this time, the bird's underwings showed the typical barring of a bird in its first year of life. However, photos taken right at the end of the bird's stay show that it had begun to moult some of the feathers on the underwing. If this had been a Red-footed Falcon, the barred feathers should have been replaced by sooty-black ones. However, the photos show that the new feathers were a gleaming white - a diagnostic feature of Amur Falcon, the eastern counterpart of Red-foot. Most unfortunately, by the time it was twigged what these photos represented, the bird had gone! A first for Britain had been present under everyone's noses for over 30 days and the only people who had seen it had not realised its identity at the time. This was not entirely surprising; the bird was regularly quite elusive, it was not at all obvious until the underwing moult had progressed, and the majority of observers probably didn't have a field guide that contained the species! Amur Falcon breeds on the steppes of north-east Asia and performs a spectacular migration, passing down across India and then crossing the Indian Ocean to winter in southern Africa. There are only a handful of European records, and the only previous bird recorded in Britain (in 1984: hit by a car in Yorkshire, taken into care, released and then shot by a gamekeeper in Dumfries & Galloway) was found to be ringed and later shown to have been released from a rehabilitation centre in France. The circumstances of its appearance at this centre are not known. BUBO Listing has now added Amur Falcon as a provisional species to all authorities available to British listers. As ever, if this species is later found not to be acceptable by the BOURC it will be removed from BUBO Listing. Thanks go to Dave Mansell (www.eastaytonbirding.com) for allowing us to reproduce his critical photo of this bird.